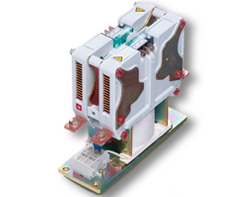 Compact double-pole high-voltage NO contactor for DC and AC operation: With its compact size and efficient arc chute the Schaltbau C295 series contactor allows the handling of voltages up to 1500 V and currents of 120 A max. Switching high amperage even at significant inductance can be achieved by series connection of the main contacts, whereas parallel connection results in longer contact life. Typical applications are to be found in traffic engineering equipment, particularly in heating circuits, air conditioning equipment and conversion engineering of complex power supplies.